Will Bangalore’s Women Municipal Workers Ever Get What They Are Demanding? Rangamma is a pourakarmika who works near the Aiyappa Temple in Sunkadakatte, in Bangalore. 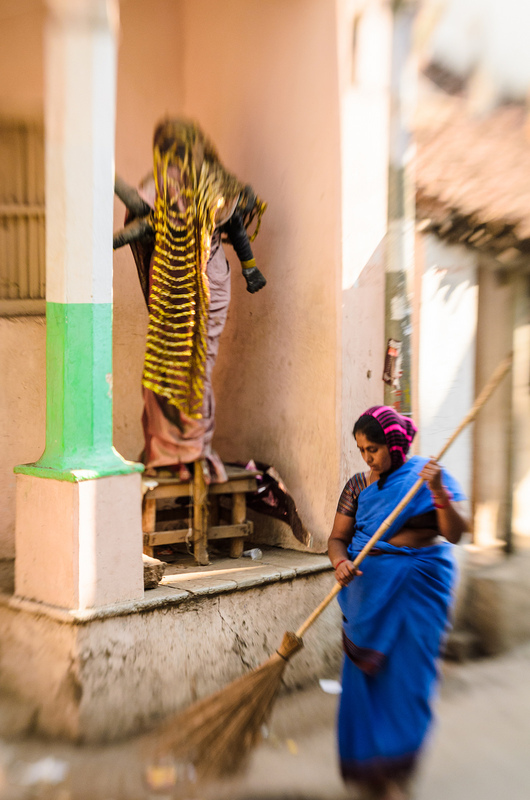 She leaves her house near Magadi Road at 5.45 am, and usually reaches work just in time, by 7 am. 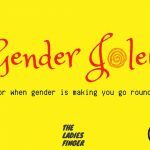 It has become essential that she earn enough money to run her house – her husband passed away a long time ago, and she has a son she describes as “poli” (a wastrel). Rangamma says she needs enough money to pay the rent for her house and money for food; she remembers months in which the BBMP conveniently forgot to give her her salary, until she joined a union – the BBMP Guttige Pourakarmika Sangha. Pourakarmikas – 80 percent of whom are women, according to the union – sweep roads and collect and segregate garbage. 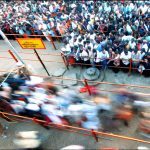 For many years now, there have been periodic articles on the plight of pourakarmikas in Bangalore. Every article is about the same demands that they have put forward – an increase in salaries that are much lower than they should be, permanent jobs rather than contractual ones, access to brooms, gloves, masks, and gum boots that the government should be providing anyway, and toilets for them to use when they are at work. These articles have not stopped because pourakarmikas have never had these demands met – they are still demanding better wages and basic facilities. And it isn’t limited to Karnataka – earlier this year, municipal corporation workers in Delhi blocked roads and went on strike because they hadn’t received their salaries. The North Delhi Municipal Corporation had said they had received no funds from the government to pay the workers their salaries for January and February this year. 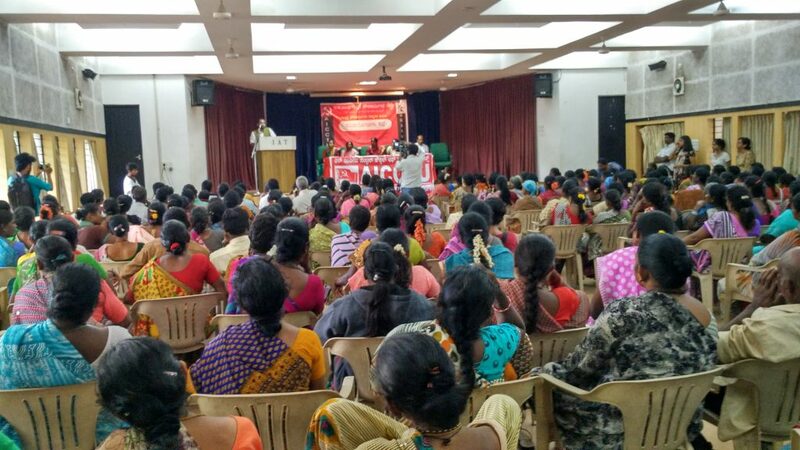 A public consultation on minimum wages held in Bangalore on June 15, 2016. Photo courtesy BBMP Guttige Pourakarmika Sangha. The BBMP Guttige Pourakarmika Sangha, and the All India Central Council of Trade Unions (AICCTU), to which it is affiliated, organised a public consultation on 15th June, at the Institute of Agricultural Technologists (IAT). Everyone who attended the consultation was employed on a contractual basis – the basic facilities that they demanded are said to be provided only to workers with permanent employment. In 2012, contract pourakarmikas had protested against the decision that women above the age of 50 be prevented from working. The audience at the consultation this week, comprised mostly of older women, vehemently rejected the BBMP’s proposal to employ pourakarmikas through self-help groups (SHGs), which they equated to contractors who have so far never given them their salaries on time, often withholding them for months on end. The women also demanded that their salaries be raised to a minimum of Rs 21,865. 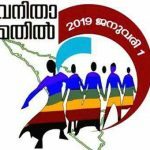 According to the sangha, current salaries are Rs 8,860 including ESI and PF (though many of the women say they are not given access to their ESI or PF funds) and the last wage revision was in 2011. The sangha says that under the Minimum Wages Act, wages are to be revised at least once every five years. In July 2015, the state Minimum Wages Advisory Board recommended that the government fix the wages of contract pourakarmikas at Rs 14,040. However, the government is yet to notify the revised wages. Clifton D’Rozario, advocate at Manthan Law (which provides legal assistance to those who can’t afford it) and president of the BBMP Guttige Pourakarmika Sangha, said at the consultation that the government’s attempt to bring in SHGs to carry out solid waste management is just another attempt to give the control of solid waste management to a contractor. “There is so much money in solid waste management, but there’s a lobby of contractors and NGO workers who are backing the BBMP and are the ones who will make the money,” he said, and added that it wasn’t like the government had no money to spend – it was just that they were certain the pourakarmikas wouldn’t leave. But Rangamma is certain that the reason the government has never followed up on the demands of pourakarmikas is both because they are mostly women, and because of their caste (most of them are Dalit). “I’ve been at the receiving end of comments from contractors on both these grounds – first they say that women simply complain about everything, they call us names; they don’t even consider the possibility that a woman can stand up and make demands. And then they call us names because of our jati, saying that there’s no other job that we can take,” she says. “Our families have done the same thing that we do – it’s as though people take this as an excuse to treat us how they want. You know how people who own big bungalows talk to us? As though they can’t come close. If we ask for water, they will ask us to bring a bottle, and pour it standing far away from us,” says Anjanamma, who works in Koramangala. Some time ago, Rangamma was removed from her job when she asked about her salary. She ran around trying to get her job back for many months, with no money for food, or to pay the rent for her house – “These contractors just do what they want,” she says, “And I’ve been doing the same work for much longer than they have been contractors.” When nothing worked, Rangamma met people from the Pourakarmika Sangha, who helped her fight, and she threatened to go to court if she didn’t get her job back. The contractor reinstated her, but not in the same place she had always worked – she was made to work far away, with no place for food, or access to toilets. Again, she threatened to take action, and she was allowed to work in Mandya, after having to deal with employers who recorded her as ‘absent’ even when she wasn’t; “We’re not allowed to see that list, or sign against our names,” Rangamma says. 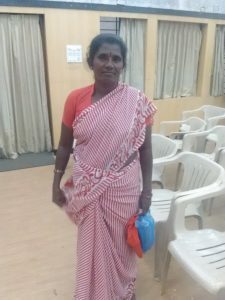 Like Rangamma, Venkatamma, who works as a pourakarmika in Koramangala, says that she has learnt that the law provides for their basic rights just as much as it does for anybody else, but they haven’t got them. “We don’t get holidays, not on Sundays, and not on any public holiday. I want a holiday for Ugadi, but I don’t get it. We work from early in the morning to 2.30 in the afternoon. Sometimes we need to buy brooms, which the government should be providing us for the job. If they don’t provide brooms and gloves, or masks which they should be giving us, it’s hardly surprising they don’t give us any kind of health benefits,” she says.